It was created in 1929 by the Lateran Treaty as a vestige of the much larger Papal States (756 to 1870 C.E.). 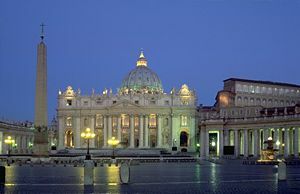 Vatican City is a non-hereditary, elected monarchy that is ruled by the Bishop of Rome—the Pope. The highest state functionaries are all clergymen of the Catholic Church. It is the sovereign territory of the Holy See and the location of the Apostolic Palace—the Pope's official residence—and the Roman Curia. Thus, while the principal ecclesiastical seat of the Pope as Bishop of Rome (the Basilica of St. John Lateran) is located outside of its walls, Vatican City is the governmental capital of the Catholic Church. Vatican City is also home to cultural treasures such as St. Peter's Basilica, the Sistine Chapel and the Vatican museums, featuring some of the world's most famous paintings and sculptures. It is thus one of the world's most popular tourist attractions and the site of many public appearances by the Roman Pontiff. The name "Vatican" is ancient and predates Christianity, coming from the Latin Mons Vaticanus, Vatican Hill. The territory of Vatican City includes part Vatican Hill and adjacent former fields where St. Peter's Basilica, the Apostolic Palace, the Sistine Chapel, and Vatican museums now stand, along with various other buildings. The area was part of the Roman ward of Borgo until 1929. Separated from the main city on the west bank of the Tiber river, the area was an outcrop of the city protected by its inclusion within the walls built by Leo IV (ninth century), and later expanded by the current fortified walls of Paul III, Pius IV, and Urban VIII in the sixteenth and seventeenth centuries. but the line of certain buildings supplied part of the boundary, and for a small part of the frontier a modern wall was constructed. The territory included St. Peter's Square, which was not possible to isolate from the rest of Rome, and therefore a largely imaginary border with Italy runs along the outer limit of the square where it touches on Piazza Pio XII and Via Paolo VI. 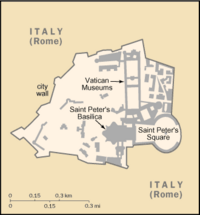 St. Peter's Square is reached through the Via della Conciliazione which runs from the Tiber River to St. Peter's. This grand approach was constructed by Mussolini after the conclusion of the Lateran Treaty. According to the Lateran Treaty, certain properties of the Holy See that are located in Italian territory, most notably Castel Gandolfo and the Patriarchal Basilicas, enjoy extraterritorial status similar to that of foreign embassies. These properties, scattered all over Rome and Italy, house essential offices and institutions necessary to the character and mission of the Holy See. The Pope is ex officio head of state of the government of Vatican City. He is simultaneously the bishop of the Diocese of Rome and Supreme Pontiff of the Catholic Church. The term Holy See expresses the totality of his governance and pastoral ministry. His official title with regard to Vatican City is Sovereign of the State of the Vatican City. The pope is a non-hereditary, elected monarch who exercises absolute authority—supreme legislative, executive and judicial power over the Vatican City. He is the only absolute monarch in Europe. The pope is elected for a life term in conclave by cardinals under the age of 80. His principal subordinate government officials for Vatican City are the Secretary of State, the President of the Pontifical Commission for Vatican City State, and the Governor of Vatican City. 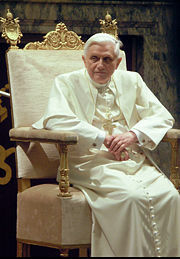 The current Pope, as of 2007, is Benedict XVI, born Joseph Ratzinger in Germany. Tarcisio Cardinal Bertone of Italy is the Secretary of State. Italian Archbishop Giovanni Lajolo serves as both the President of the Pontifical Commission and Governor. Both Bertone and Lajolo were appointed by Pope Benedict in September 2006. 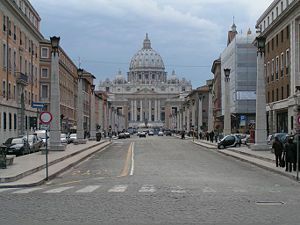 Even before the arrival of Christianity, it is supposed that this originally uninhabited part of Rome (the ager vaticanus) had long been considered sacred, or at least not available for habitation. The area was also the site of worship to the Phrygian goddess Cybele and her consort Attis during Roman times. Agrippina the Elder (14 B.C.E.-33 C.E.) drained the hill and environs and built her gardens there in the early first century C.E. Emperor Caligula (37-41 C.E.) started construction of a circus, (circle) that was later completed by Nero, the Circus Gaii et Neronis. The Vatican obelisk was originally taken by Caligula from Heliopolis to decorate the spina of his circus and is thus its last visible remnant. This area became the site of martyrdom of many Christians after the great fire of Rome in 64. Ancient tradition holds that it was in this circus that Saint Peter was crucified upside down. Opposite the circus was a cemetery separated by the Via Cornelia. Funeral monuments, mausoleums, and small tombs as well as altars to pagan gods, were constructed lasting until just prior to the erection of the Constantinian Basilica of St. Peter's in the first half of the fourth century. Remains of this ancient necropolis were brought to light sporadically during renovations by various popes throughout the centuries increasing in frequency during the Renaissance until it was systematically excavated by orders of Pope Pius XII from 1939 to 1941. In 326 C.E., the first church, the Constantinian Basilica, was built over the site that is believed to be the tomb of Saint Peter, buried in a common cemetery on the spot. From then on the area started to become more populated, but mostly by common dwelling houses. A palace was constructed near the site of the basilica as early as the fifth century during the pontificate of Pope Symmachus (reigned 498-514). Popes in their secular role gradually came to govern neighboring regions and, through the Papal States, ruled a large portion of the Italian peninsula for more than a thousand years until the mid-nineteenth century, when most of the territory of the Papal States was seized by the newly created Kingdom of Italy. 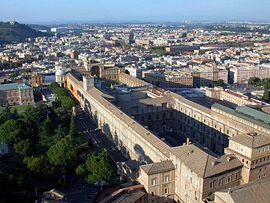 For much of this time the Vatican was not the habitual residence of the Popes, who lived at the Lateran Palace and, in recent centuries, the Quirinal Palace. The papal residence from 1309-1377 was at Avignon in France. In 1870, the Pope's holdings were left in an uncertain situation when Rome itself was annexed by the Piedmont-led forces which had united the rest of Italy. Between 1861 and 1929 the status of the Pope was referred to as the "Roman Question." The popes were undisturbed in their Vatican palace, and given certain recognition by the Law of Guarantees, including the right to send and receive ambassadors. But they did not recognize the Italian king's right to rule in Rome, and they refused to leave the Vatican compound until the dispute was resolved in 1929. Other states continued to maintain international recognition of the Holy See as a sovereign entity. Mussolini demolished medieval housing to create the Via della Conciliazione, leading to St. Peter's Square. In practice, Italy made no attempt to interfere with the Holy See within the Vatican walls. However, they confiscated church property in many other places, including, perhaps most notably, the Quirinal Palace, formerly the pope's official residence. Pope Pius IX (1846-1878), the last ruler of the Papal States, claimed that after Rome was annexed he was a "Prisoner in the Vatican." This situation was finally resolved on February 11, 1929 in an agreement between the Holy See and the Kingdom of Italy. The treaty was signed by Benito Mussolini and Pietro Cardinal Gasparri in behalf of King Victor Emmanuel III and Pope Pius XI (1922-1939), respectively. The Lateran Treaty and the Concordat established the independent State of the Vatican City and granted Catholicism special status in Italy. In 1984, a new concordat between the Holy See and Italy modified certain provisions of the earlier treaty, including the position of Catholicism as the Italian state religion. For historical reasons, the government of Vatican City has a unique structure. As noted, the principal figures are the Secretary of State, the President of the Pontifical Commission for the Vatican City State, and the Governor of Vatican City. These, like all other officials, are appointed by the Pope and can be dismissed by him at any time. During a papal vacancy, the Chamberlain of the Holy Roman Church, former Secretary of State, and former President of the Pontifical Commission form a commission that performs some of the functions of the head of state; while another made up of the Chamberlain and three cardinals (one being chosen by lot every three days from each order of cardinals), performs other functions of the head of state. All decisions of these commissions must be approved by the College of Cardinals. The State of the Vatican City, as created by the Lateran Treaty, enables the Holy See to exist with a temporal jurisdiction, territorial identity, recognition, and independence within a small territory as a true nation-state in the eyes of other nations after the loss of the Papal States in 1870. The Vatican City State is not synonymous with the Holy See. It is a significant but not essential constituent entity of it. 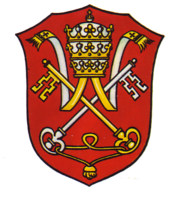 The Holy See has existed continuously as a juridical entity since Roman Imperial times and had been recognized by other sovereigns, nations and foreign powers as a powerful and independent sovereign entity since late antiquity to the present, even during periods when it held no territory (e.g. 1870 to 1929). The Holy See has the oldest active continuous diplomatic representation or service in the world, dating back to at least 325 C.E. with its legation to the Council of Nicea. Indeed, other nations have their diplomatic relations with the Holy See, never the Vatican City State. Prior to reforms made by Pope Paul VI (reigned 1963-1978), a large number of nobles existed within the government of the Vatican. A noble class still exists today and continues to form part of the papal court. The size of the papal court, however, had been reduced. All cardinals, however, continue to have the royal rank of "prince of the blood." The rank's royal character is a vestige of the temporal power of the popes who ruled the Papal States for more than a thousand years and, prior to the Papal States, as the highest civil and religious authority of the Roman and Byzantine empires in Rome since late antiquity. Therefore, within this context, the State of the Vatican City is a true, although elected, monarchy in every sense of the word. The Governor of Vatican City, sometimes known as the President of the Pontifical Commission for Vatican City, has duties similar to those of a mayor or city executive, concentrating on material questions concerning the state's territory, including local security, but excluding external relations. Legislative power is vested in the Pontifical Commission for Vatican City State, led by a president. Members are cardinals appointed by the pope for terms of five years. The judicial functions are handled by three tribunals—the Apostolic Signatura, the Sacra Rota Romana, and the Apostolic Penitentiary, which are also the judicial arm of the Holy See (see below). The legal system is based on canon, or ecclesiastical, law; if Canon Law is not applicable, special laws of the territory apply, often modeled on Italian provisions. 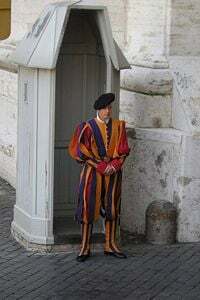 A member of the Swiss Guard at his post. The Vatican City State has the distinction of having the smallest and oldest regular army in the world, the Swiss Guard. It was founded by Pope Julius II on January 22, 1506, and originally made up of Swiss mercenaries from the Swiss Confederation. They currently number a little over 100 men and are also the personal bodyguards of the Pope. Recruitment is restricted to Catholic, male, Swiss citizens. The Palatine Guard and the Noble Guard were disbanded during the reign of Pope Paul VI in 1970, while the Corpo della Gendarmeria acts as the internal police force. Its full name is Corpo della Gendarmeria dello Stato della Città del Vaticano. External defense is handled by the surrounding state of Italy, since the Vatican has no navy and no air force. Vatican City has its own post office, fire brigade, police service, commissary (supermarket), bank, railway station, electric plant, and publishing house. The Vatican also controls its own Internet domain (.va). Vatican Radio, which was originally organized by Guglielmo Marconi, today offers short- medium- and long-wave and broadband service around the world. The Vatican has also been given a radio ITU prefix, HV, and this is sometimes used by amateur radio operators. Transmission antennae are located in Italian territory. Television services are provided through another entity, the Vatican Television Center. L'Osservatore Romano is the semi-official Vatican newspaper, published daily in Italian, and weekly in English, Spanish, Portuguese, German, and French (plus a monthly edition in Polish). It is published by a private corporation under the direction of Catholic laymen but carries official information. Acta Apostolicae Sedis is the official publication of the Holy See, carrying the official texts of Church documents, but is little read other than by scholars and Church professionals. Official documents are also available on the Vatican website. 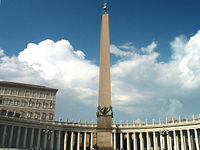 The unique economy of Vatican City is supported financially by contributions (part of which is known as Peter's Pence) from Catholics throughout the world, the sale of postage stamps and tourist mementos, fees for admission to museums, and the sale of publications. The Vatican City issues its own coins. It has used the euro as its currency since January 1, 1999, owing to a special agreement with the EU (council decision 1999/98/CE). Euro coins and notes were introduced in January 1, 2002—the Vatican does not issue euro banknotes. Issuance of euro-denominated coins are strictly limited by treaty, though somewhat more than usual is allowed in a year in which there is a change in the papacy. Because of their rarity, Vatican euro coins are highly sought by collectors. Until the adoption of the Euro, Vatican coinage and stamps were denominated in their own Vatican lira currency, which was on par with the Italian lira. Budget: Revenues (2003), $252 million; expenditures (2003) $264 million. Industries: printing and production of few mosaics and staff uniforms; worldwide financial activities. Almost all of Vatican City's 558 citizens either live inside the Vatican's walls or serve in the Vatican's diplomatic corps in embassies (called "nunciatures"; a papal ambassador is a "nuncio") around the world. The Vatican citizenry consists almost entirely of two groups: clergy working as officials of the Vatican as a state or of the Catholic Church; and the Swiss Guard. Most of the 3,000 lay workers who comprise the majority of the Vatican work force reside outside the Vatican and are citizens of Italy, while a few are citizens of other nations. As a result, all of the City's actual citizens are Catholic. Catholicism is the state religion. All the places of worship inside Vatican City are Catholic. The Vatican has no set official language, it can be changed at any moment by the current Pope. The language most often used for the authoritative version of official documents of the Catholic Church or emanating from the Pope is Latin. However, Italian and, to a lesser extent, other languages are generally used for most conversations, publications, and broadcasts and most documents or other communications dealing directly with the Vatican as a state are most easily available in Italian. German is the official language of the Swiss Guard. The Vatican's official website languages are Italian, German, English, French, Spanish, and Portuguese. Citizenship of Vatican City is conferred upon some of those who have been appointed to work in certain capacities at the Vatican, and it is usually revoked upon the termination of their employment. During the period of employment citizenship may also be extended to a Vatican citizen's spouse. Terms of citizenship are defined in the Lateran Treaty, and laws concerning the creation of the Vatican state in 1929 sought to restrict the number of people who could be granted Vatican citizenship. The only passports issued by the Vatican are diplomatic passports. As of December 31, 2005, of the 558 people with Vatican citizenship, 246 were dual-citizens of other countries (the majority being Italian). The Lateran Treaty provides that in the event a Vatican citizen has his or her original nationality revoked and also loses Vatican citizenship, he or she will be automatically granted Italian citizenship. Providing a territorial identity for the Holy See, Vatican City State is a recognized national territory under international law. However, it is the Holy See that is the legal body that conducts diplomatic relations for the Vatican City in addition to the Holy See's usual diplomacy, entering into international agreements and both receiving and sending diplomatic representatives. Because of the very limited territory of the Vatican state, foreign embassies to the Holy See are located in the Italian part of Rome; Italy actually hosts its own Embassy of Italy. The Holy See is currently the only European political entity that has formal diplomatic relations with Taiwan. Despite its minuscule size, as the veritable headquarters of the Catholic Church, the Vatican's influence on world affairs is disproportionately immense by virtue of its moral and spiritual authority. 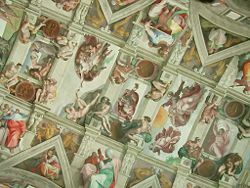 Detail of the Sistine Chapel ceiling. The Vatican City is itself of great cultural significance. Buildings such as St. Peter's Basilica and the Sistine Chapel are home to some of the most famous art in the world, which includes works by artists such as Botticelli, Bernini, and Michelangelo. The Vatican Library and the collections of the Vatican Museums are of the highest historical, scientific, and cultural importance. In 1984, the Vatican was added by UNESCO to the List of World Heritage Sites; it is the only one to consist of an entire country. Furthermore, it is the only site to date registered with UNESCO as a centre containing monuments in the "International Register of Cultural Property under Special Protection" according to the 1954 Hague Convention for the Protection of Cultural Property in the Event of Armed Conflict. ↑ Altar of Cybele in Vatican Museum. mv.vatican.va. Retrieved June 10, 2007. ↑ Vatican City. Catholic-Pages.com. Retrieved March 4, 2007. ↑ Vatican web site, Vatican Web Site. Retrieved April 14, 2008. ↑ Vatican influence on the United Nations, the World Health Organization and other international agencies. www.population-security.org. Retrieved March 16, 2007. The Holy See—The Vatican's Official Website www.vatican.va. Vatican influence on the United Nations, the World Health Organization and other international agencies. www.population-security.org. This page was last modified on 16 January 2016, at 16:34.